And the scripture, foreseeing that God would justify the heathen through faith, preached before the gospel unto Abraham, saying, In thee shall all nations be blessed. So then they which be of faith are blessed with faithful Abraham. For as many as are of the works of the law are under the curse: for it is written, Cursed is every one that continueth not in all things which are written in the book of the law to do them. But that no man is justified by the law in the sight of God, it is evident: for, The just shall live by faith. And the law is not of faith: but, The man that doeth them shall live in them. Christ hath redeemed us from the curse of the law, being made a curse for us: for it is written, Cursed is every one that hangeth on a tree: That the blessing of Abraham might come on the Gentiles through Jesus Christ; that we might receive the promise of the Spirit through faith. There is one other interesting type thats found in Numbers 2. The 12 tribes were told to group into four camps. Each tribe had a standard and symbol, but Judah, Isaachar and Zebulin were to rally around the standard of Judah. They collectively represented 186,400. Reuben, Simeon and Gad collectively represented about 151,000. 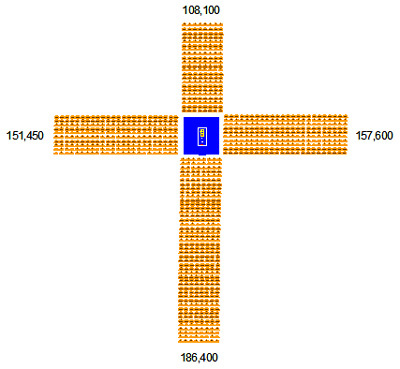 Ephraim, Manasseh and Benjamin collectively represented 108,100. Dan, Asher and Naphtali, 157,600. Judahs standard was the Lion of the Tribe of Judah. Reubens was a man. Ephraims was the ox. Dan, the eagle. These four symbols are also the four faces of the cherubim around the throne of God in Isaiah 6, Ezekiel 1 and 10, and Revelation 4. Each of the camps, of three tribes each, was to encamp on one of the four cardinal compass directions (N, S, E, or W) with respect to the camp of the Levites enclosing the tabernacle. We can only guess at how much space was required by the Levites, whether it was 100 feet on a side, 100 yards, or whatever. But whatever it was, well assume that length as a basic unit. The camps of Reuben, Ephraim, and Dan had the same constraint on the south, west, and north, respectively. The length of each leg would thus be proportional to the total population in each camp. 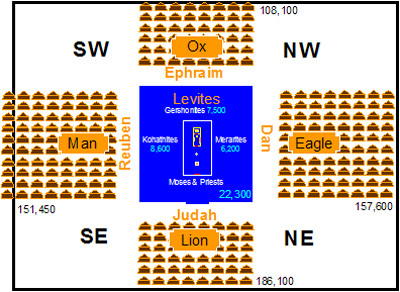 If we assemble what we can infer from the Biblical account, we can imagine what the camp of Israel looked like from above: the tabernacle and the Levites in the center, surrounded by the four faces of the tribal standards, and each of the four camps of Judah, Ephraim, Reuben, and Dan, stretching out in the four cardinal directions. We can also tally the size of each tribe to total the relative length of each camp as they stretched out in each of the four directions. The particle, whose existence has been predicted by theoreticians, would help to explain why matter has mass. Finding the Higgs boson is the major goal of the Large Hadron Collider at CERN along the French –Swiss border. Who is the image of the invisible God, the firstborn [prototokos] of every creature. For by Him were all things created, that are in heaven, and that are in earth, visible and invisible, whether they be thrones, or dominions, or principalities, or powers: all things were created by Him, and for Him: And He is before all things, and by Him all things consist (sunistemi). The nucleus of the atom contains positively charged and neutral particles-to use a simplistic model. Mutual electrostatic repulsion between the like-positive protons would drive the nucleus apart if it were not for the “strong force” which binds the nucleus together. Looking for and hasting unto the coming of the day of God, wherein the heavens being on fireshall be dissolved, and the elements shall melt with fervent heat? 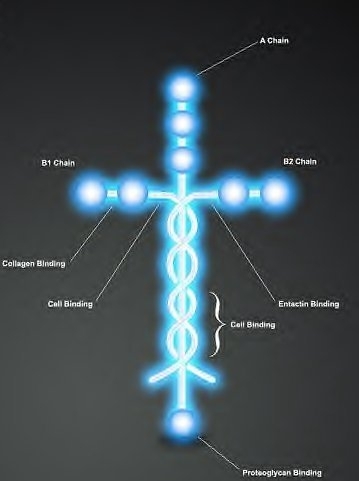 The structure of laminin is very important for its function. It is that structure that I found so amazing when Pastor Gene Payne of Raleigh, NC sent me a photo. It was so amazing that, although I respect Pastor Payne enormously, I immediately suspected he’d been taken in by hoax and checked it out on Snopes.